EB SMART GLASS is an innovative laminated glass that at the touch of a switch, changes its state from transparent to opaque granting instant privacy. It is composed of polymer dispersed liquid crystal film (PDLC). By applying a small electrical current, user can change state from opaque to transparent. 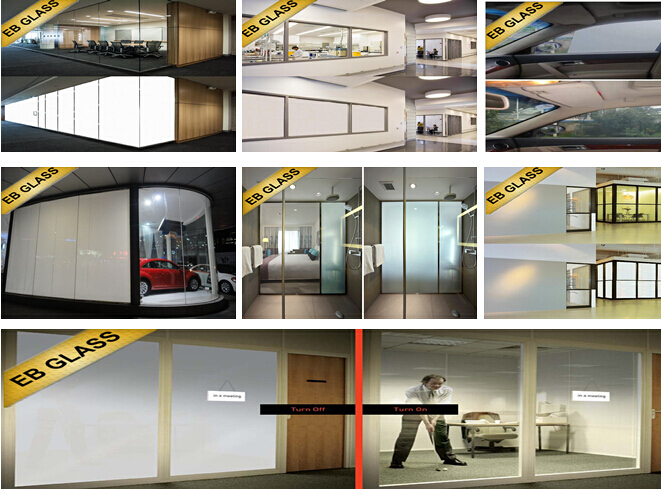 EB GLASS provide integrated systems of electronically controllable smart glass that control light and privacy of windows, skylights, doors, partitions, as well as multi-purpose projection screens. Beginning with system design and planning through fabrication and installation, the company is involved at every phase of integration to ensure that customers’ expectations are met or exceeded. EB GLASS also provides you with the possibility to adapt our product as a high resolution LCD screen which permits you to place your projector and relevant equipment behind the screen (retro projection). Custom manufactured to your project specification. Multi- colors with EBSG for customers’ choice. Engaged in offering highest quality of standards in aesthetics and functionality, EB GLASS have our R&D to improve products properties. EB GLASS work very hard to offer the highest customer service . We always offer a professional and quick customer care service with our professionalism. EB GLASS offers the quickest turnaround for your project all over the world within 20 days lead time. From product consultant to the logistic arrangement, Place your order in EB GLASS, Then everything done by us. A simple ON/OFF mode switches this intelligent film and glass from frosted (translucent) to clear (transparent). In its frosted state the material becomes a high definition rear projection surface providing privacy and security. partially impede the pass of the light and cause the opacity. -Outstanding tech support and engineering troubleshooting. -Multiple pieces that can be configured to operate in unison or independently. - 220/240VAC-50Hz or 110/120VAC/50Hz plug and play. -Power of Transformer:50w, 100w, 200w, 800w other customized. -Smart glass operates by applying electric current through a specifically programmed transformer. Depending on the surface area, many panels can be controlled at the same time. -Operation mode:On/off, Dimming, remote control. -Power consumption: less than 5watt/square meter. -What is MOQ? Small order quantity is acceptable. -Can you project on Smart glass? Yes, smart glass is ideal as a projection screen. -Is smart glass energy efficient? It is less than 5 watts per square meter. -What’s the lead time? Generally within 20 days. -How can i purchase or get a quote? Pls simple email or call us with your details of your project. -Is there any electrical fittings with smart glass? Yes, we have transformer with remote control to go with glass. -Do you Install? No, we only supply & delivery our smart glass. -Can it get wet? Yes, it applied for wet rooms. -Can the glass be joint with clear joints? Yes, you can have a clear silicone joint. -How to clean my smart glass? Clean with a soft cloth. Avoid harsh chemicals and sharp instruments. -What’s the sound insulation of smart glass? Appx. 36dB.